WILMINGTON, NC, March 22, 2017 – In Partnership with the Basilica Shrine of St. Mary, Cape Fear Solar Systems provided a medical clinic in Honduras with a power system to improve local healthcare. The Clinica Santa Maria in Honduras was built in 2008 by the St. Mary’s parish in Wilmington, NC. It is located in a town called Reitoca in the Honduran department of Francisco Morazán. Today, thanks to the many supporters from Wilmington, the clinic provides comprehensive health care for children and adults. 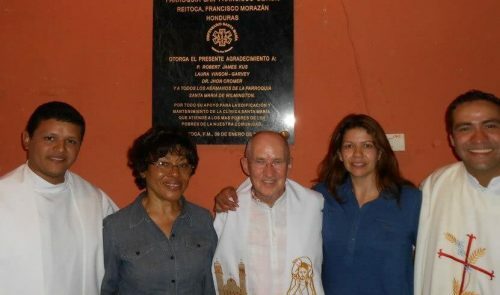 Father Bob, from the St. Mary Basilica, met during his visit in Honduras with Father Carlos, and started this project together. “A medical facility was what was the most needed in the area, and now, 8 years later, with the help of Father Bob, the Wilmington parish and its many supporters, we were able to build a clinic with a pharmacy to provide consistent help,” says the project’s executive director, Laura Vinson. She travels to Honduras 4-5 times a year to oversee the operations of the clinic. St. Mary Basilica donated treatments for people with asthma and lung cancers, and with the help of SaludHondu, a fundraising organization, created by parishioners at St. Mary’s and Father Bob to help the facility with funding, continues to support the lives of its patients. The clinic treats approximately 600 patients a month. Some of the patients walk three hours each way to see a doctor or to receive the breathing treatments. But one of the biggest obstacles has been frequent power outages and not having at least one whole day to energize medical equipment. Local doctors were unable to perform treatments because of the lack of electricity. In the past, the medical establishment used an emergency generator to help during power outages, but having access to fuel was also a problem. Solar power with a battery backup provided energy when and where needed. “Having solar energy represents hope for many children who desperately need breathing treatments, Cape Fear Solar represents that now with this energy initiative,” explains Mrs. Vinson. In this very dusty area, hundreds of children suffer from severe allergies. In order for them to receive the nebulizer treatment (a drug delivery device used to administer medication in the form of a mist inhaled into the lungs), the children have to be transferred to the hospital. However, when there is a shortage of electricity, those kids with severe conditions could possibly die without the power and equipment to treat their symptoms. Solar energy provides hope and stability in electricity supply. “We do not realize how important it is to have energy as the majority of us never had to deal with extended power outages” adds John Donoghue, owner and president of Cape Fear Solar Systems. “Most of us take for granted that every time you flip the switch the light goes on. It is almost unimaginable that in different parts of the world someone depending on a medical treatment can die without power. “For many people in the world, electricity is a scarce resource,” highlights Mrs. Vinson. “We are happy to say that with the recent success of a simple solar power system, we are now talking with Cape Fear Solar Systems about a ground mount solar system to be able to help even more of those in need,” Laura continues. “People there have an unbelievable amount of faith and are truly an inspiration for anyone who visits. Many communities have never had electricity,” she adds. If you wish to support this initiative, visit http://saludhondu.org/, where you can donate small amounts that will make a big difference in lives of other people. 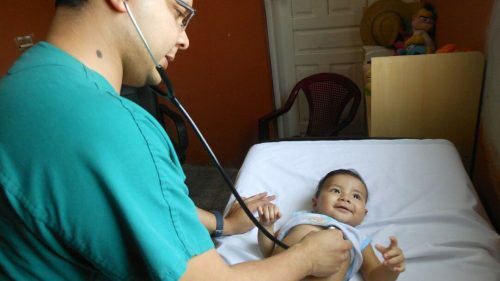 SaludHondu supports an on-going medical clinic, Clinica de Santa Maria, in Reitoca, Honduras. It is staffed by a physician, nurse, pharmacist, and facility caretaker. The clinic serves not only the town of Reitoca, but also villages from outlying and remote mountain communities. SaludHondu, headquartered in Wilmington, NC, is a 501(c)(3) non-profit organization. Through the efforts of generous donors, we provide financial support, supplies, medical equipment, and medications. Additionally, we provide health care support to the Honduran staff through periodic medical/dental brigades which we organize in the US and which travel to Honduras. For more, visit http://saludhondu.org/.